On a recent sunny morning at Woods Lake, a high-alpine haven just west of Telluride, some 700 or so native Colorado River cutthroat trout were released into the pristine water. This is where the eggs were fertilized last spring after being collected from another stream west of Montrose. They were reared at a hatchery in Rifle Falls, and developed into the healthy juvenile trout they are today: tiny but fierce. As they are dropped into the cold lake, they disperse quickly, looking for the best places to hide. That’s Eric Gardunio, a Montrose-based aquatic biologist with Colorado Parks and Wildlife. Earlier that morning, the fish were loaded into two giant plastic bags, about 300 in each. The bags were filled with ice cubes, pumped full of oxygen and stored in a cooler for the journey. Once at Woods Lake, Gardunio heads off with his fish in a backpack, bushwhacking his way around the lake, until he locates the perfect spot to release them. Within moments, they are gone. But, these aren’t just any fish. In the parking lot, before the release, curious passersby stop by the CPW truck to catch a glimpse of the fish as they are unloaded from the cooler and receive a brief lesson from CPW spokesman Joe Lewandowski. Woods Lake is one of the cornerstones of the restoration work in Colorado’s southwest region because its clean mountain water and ecosystem yields much bigger fish than other streams in the area and therefore, biologists are able to collect many more eggs. For example, in the stream where these very fish originated, they would only likely grow to be about 10 inches. The Woods Lake Colorado River cutthroat restoration project has been a year’s long effort, and actually was first introduced as an idea in the 80s. Much has had to happen since then, including the controversial removal of non-native brook trout through chemical reclamation. When Gardunio came on with CPW, it was his task to find the native cutthroat to put into Woods Lake. Gardunio is accompanied on this day at Woods Lake by Wally Johnston, a hatchery technician at the Rifle Falls Hatchery. The hatchery works with biologists and researchers around the state who provide hatchery with fertilized eggs. Johnston and his team then hatch, rear and stock them. The strategy for a high survival rate is power in numbers. Johnston says they try to overwhelm predators by releasing a large number of baby fish at once. And this batch, they have a fighting chance. 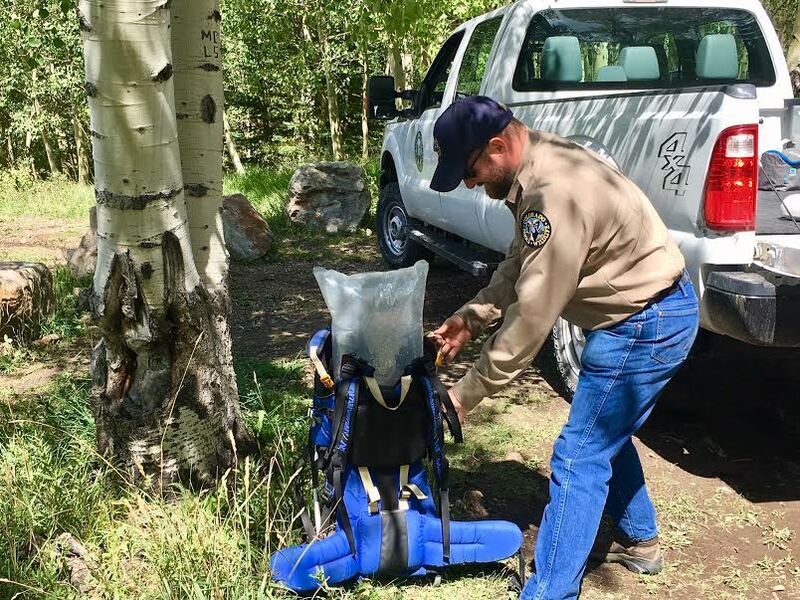 While conservation, such as ensuring the survival of native species, is at the heart of Colorado Parks and Wildlife’s mission, wildlife management is a concept that’s often overlooked and misunderstood. Gardunio says projects like the native Colorado River cutthroat restoration program is important, because the species is a symbol of the region’s natural history. For Western Slope Resources Reporting, I’m Cara Pallone.